November 2015: Health regulators are growing increasingly concerned about the serious side effects associated with Levaquin and other fluoroquinolone antibiotics, including peripheral neuropathy and tendon injury. On November 6th, the U.S. Food & Drug Administration (FDA) convened a joint meeting of its Antimicrobial Drugs Advisory Committee and Drug Safety and Risk Management Advisory Committee to discuss the safety of Levaquin and other fluoroquinolone antibiotics in the treatment of sinus infections, urinary-tract infections and bronchitis that worsens existing chronic obstructive pulmonary disease. The committees ultimately voted 21-0 to recommend stronger warnings for sinusitis; 18-2, with one abstention, on bronchitis; and 20-1 regarding urinary-tract infections. While the FDA is not required to enact the recommendations of its advisory panels, it usually does so. Since 2004, the labeling for Levaquin and other fluoroquinolone antibiotics has noted peripheral neuropathy as a potential side effect. However, in 2013, the FDA ordered the drugs’ manufacturers to strengthen those warnings after the agency determined that the labels did not adequately describe the potential for rapid onset of the condition or the possibility of permanent nerve damage. “The onset of peripheral neuropathy after starting fluoroquinolone therapy was rapid, often within a few days. In some patients the symptoms had been ongoing for more than a year despite discontinuation of the fluoroquinolone. Several patients were continued on the fluoroquinolone drug despite the occurrence of neuropathic symptoms,” the FDA noted. According to the FDA, peripheral neuropathy associated with the use of Levaquin and other fluoroquinolones can occur at any time during treatment and can last long after the drug is stopped or be permanent. Levaquin patients who develop any symptoms of peripheral neuropathy should tell their health care professionals right away. July 2008: The FDA is notifying manufactures of fluroquinlolone antimicrobial drugs (Levaquin, Cipro and others) that they need to add a Boxed Warning to the product’s labeling that warns consumers of the increased risk of tendonitis and tendon rupture in patients who take these drugs. The FDA also asked drug companies to provide patients with a Medication Guide that describes these potential Levaquin side effects. The strengthened FDA warnings apply to fluoroquinolones for systemic use (e.g., pills, tables, capsules and injectable formulations). What are the Signs and Symptoms of Tendon Rupture? Tendons connect your muscles to your joints. Tendinitis and tendon rupture most frequently involve the Achilles tendon (back of your ankle), but have also been repoted in the shoulder (rotar cuff), the hand, the biceps, and the thumb. Serious cases oftendor rupture may require surgical repair. The FDA reports that the risk of developing fluoroquinolone-associated tendonitis and tendon rupture is higher in patients who are over the age of 60, those who are taking steriods (corticosteriods) and in kidney, heart and lung transplant recepients. Between November 1997 and December 2005, the FDA received reports of 262 cases of tendon ruptures, 258 cases of tendonitis, and 274 cases of other tendon disorders associated with the use of fluoroquinolone antibiotics, with 175 of those occurring since the beginning of 2003. From January 2006 through March 31, 2007 the FDA adverse events database received 74 additional reports of tendon ruptures, for a total of 336 cases of tendon rupture reported since November 1997. If you were injured by a fluoroquinolone antibiotic, contact Bernstein Liebhard’s experienced Levaquin attorneys to learn more about your legal rights. Free and confidential case evaluation can be obtained by calling (877) 779-1414 or by clicking here. Bernstein Liebhard LLP is a nationally recognized law firm located in New York City that exclusively represents injured plaintiffs in a variety of individual and class actions. The Firm was named by The National Law Journal to the Plaintiffs’ Hot List, recognizing the top plaintiffs firms in the country, for 12 consecutive years. 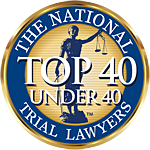 Bernstein Liebhard LLP is the only firm in the country to be named to this prestigious list for a dozen consecutive years. Our experienced Levaquin trial attorneys are standing by ready to review your case. We represent our injured clients on a contingency fee basis, meaning that we advance all costs and do not collect any attorneys’ fees unless we are able to obtain a recovery on your behalf.